Gang Wars! Rock n’ Roll! Fine Knits! 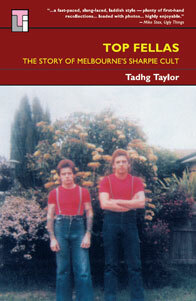 Top Fellas is the story of Melbourne’s 1960’s/70’s sharpie cult. Originally published with great success in 2004 it inspired a revival of interest in the sharpie phenomenon resulting in sharpie websites, exhibitions, magazine articles and fiction. 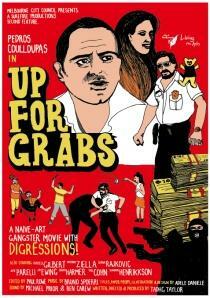 Now, due to overwhelming demand, it’s available again. Sharpie was born in mid-sixties Melbourne, progeny of mod, rocker and Mediterranean tailoring. For nigh on twenty years sharpies bossed the teenage world of coffee bars, pool halls, suburban dances and roller rinks. They loved dancing, spiffy threads and belting ten shades of sugar out of each other. From the 1960’s era of Billy Thorpe, flag pants and taking on the bouncers at the Village Green Hotel to the 1970’s era of Billy Thorpe, Staggers jeans and taking on the bouncers at the Village Green Hotel, Top Fellas is the full story of the great sharp epic, told in a lively, borderline amoral, style. Packed with first hand accounts from ex-sharps and rock n’ rollers like Lobby Loyde, Angry Anderson and Skyhooks Greg Macainsh, illustrated with over fifty photos of teenagers in cardigans, Top Fellas is the most thorough account of an Australian mass-pop movement ever put into print!